At least 43 Afghan soldiers have been killed and nine wounded after two suicide bombers in Humvee armoured vehicles destroyed a military base in the southern province of Kandahar. Six are still missing and 10 militants are also said to have died. 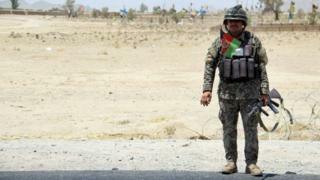 Separately, two members of the security forces died in a siege of police headquarters in the eastern province of Ghazni. The Taliban said they were behind the early morning bloodshed. The attacks are the third and fourth major assaults on Afghan security forces this week. Only two soldiers are known to have survived the Kandahar attack without injuries, AFP news agency reports. "Unfortunately there is nothing left inside the camp," defence ministry spokesman Dawlat Waziri said. "They have burned down everything they found inside." It happened in the Chashmo area of Maiwand district. Afghanistan's army and police suffered heavy casualties this year at the hands of the Taliban, who want to re-impose their strict version of Islamic law in the country. This week, more than 100 people died in four attacks. On Tuesday, Taliban suicide bombers and gunmen killed at least 41 people when they stormed a police training centre in the eastern Afghan city of Gardez. About 150 people were injured in the violence. The local hospital, in Paktia province, said it was "overwhelmed" and issued an urgent appeal for blood donors. The same day, at least 30 more people died in car bombings in Ghazni province. Armoured Humvee vehicles filled with explosives were detonated near the provincial governor's office before gunmen moved in.